In relatively simple choice tasks, some animals seem to behave irrationally by making suboptimal choices. Zentall (2019) suggests that these animals may choose according to a variety of heuristics that are adaptive in their natural environments but maladaptive in the contrived laboratory settings. We argue that Zentall’s specific heuristics range from the reasonable and testable to the conceptually confused and even inconsistent. To be useful, heuristics must be clearly defined, delimited, and coordinated with known behavioral processes. Author Note: Marilia Pinheiro de Carvalho, Federal University of Pará, Núcleo de Teoria e Pesquisa do Comportamento, Campus Universitário do Guamá, Rua Augusto Corrêa, 01, CEP: 66075-110, Belém, Pará. Correspondence concerning this article should be addressed to Marilia Pinheiro de Carvalho at marilia.pinheiro.carvalho@gmail.com. Acknowledgments: Cristina Santos was supported by doctoral fellowship 438355 from the Mexican Council of Science and Technology (CONACyT). Catarina Soares was supported by doctoral grant PD/BD/128458/2017 from the Portuguese Foundation of Science and Technology. Zentall’s (2019) target article, “What suboptimal choice tells us about the control of behavior,” is in three parts. The first part reviews a set of studies that have yielded surprising findings: In relatively simple choice tasks, animals seem to behave irrationally by making suboptimal choices. The second part introduces a set of hypotheses to account for the surprising findings: Animals may behave according to a variety of heuristics that are adaptive in their natural environments but maladaptive in the contrived laboratory settings. The third part explains what suboptimal choice in fact tells us about the control of behavior. In this commentary we argue that Part 1 is timely, interesting, and important; that Part 2, potentially the article’s greatest contribution, includes imaginative, testable hypotheses alongside conceptually confused and even inconsistent hypotheses; and that Part 3 may be too vague to be useful. We conclude with some general remarks on the nature of the problems brought to our attention by the target article. A pig was conditioned to pick up large wooden coins and deposit them in a large “piggy bank.” The coins were placed several feet from the bank and the pig required to carry them to the bank and deposit them, usually four or five coins for one reinforcement. … Pigs condition very rapidly, they have no trouble taking ratios, they have ravenous appetites (naturally), and in many ways are among the most tractable animals we have worked with. However, this particular problem-behavior developed in pig after pig, usually after a period of weeks or months, getting worse every day. At first the pig would eagerly pick up one dollar, carry it to the bank, run back, get another; carry it rapidly and neatly, and so on, until the ratio was complete. Thereafter, over a period of weeks the behavior would become slower and slower. He might run over eagerly for each dollar, but on the way back, instead of carrying the dollar and depositing it simply and cleanly, he would repeatedly drop it, root it, drop it again, root it along the way, pick it up, toss it up in the air, drop it, root it some more, and so on. … The behavior persisted and gained in strength in spite of a severely increased drive—he finally went through the ratios so slowly that he did not get enough to eat in the course of a day. … This problem behavior developed repeatedly in successive pigs. (Breland & Breland, 1961, p. 683). What surprises us in this case is that behavior appropriate to the reinforcement contingencies was initially learned but then replaced by behavior inappropriate to the contingencies. The food promptly earned at first was significantly delayed later on. The cases described by Zentall in the target article are similar to the preceding cases in the sense that they also surprise us because they are at odds with our basic conceptions or theories of behavior and learning. The novelty of Zentall’s cases is that they all involve explicit choice. In the less-is-better and the ephemeral reward tasks, the animal chooses the option that yields less food, and in the midsession reversal (MSR) task the animal chooses the incorrect option despite the presence of seemingly easy-to-use local cues to the correct option. When research findings violate basic conceptions and theories—when they surprise us—they typically set the agenda for subsequent empirical and theoretical research. Empirically, researchers attempt to assess the reliability and generality of these findings, including the conditions under which they occur. Theoretically, researchers revise their conceptions and theories to reconcile them with the surprising findings. Hence, as Zentall claims, the surprising findings of suboptimal, and seemingly irrational, choice may indeed help us better understand the learning processes. Their description is both interesting and important. The second part of the target article presents Zentall’s specific hypotheses to “save the appearances” in each of the suboptimal choice categories. They are arguably the author’s most important contribution. We consider them in context, following the same order as in the target article. In the seminal work by Silberberg, Widholm, Bresler, Fujita, and Anderson (1998), long-tailed macaques, rhesus monkeys, and a chimpanzee were indifferent between a mixture option (a slice of a preferred food plus a slice of a less preferred food) and a single-item option (a slice of the preferred food). To explain this surprising result, the authors proposed that the primates valued the preferred item of each option but not the less preferred item, so the two options had similar values. However, a decade later, Beran, Ratliff, and Evans (2009, Experiments 2–3) showed that chimpanzees preferred the single-item option to the mixture option, the “less-is-better” effect. Subsequent research showed that the effect cannot be due to a bias for smaller amounts of food, because when the animals choose between two slices of the preferred food and one slice of it, or between two slices of the less preferred food and one slice of it, they prefer the two slices. The effect is also not because the more preferred and less preferred items have positive and negative value, respectively, such that the mixture would have a smaller net value than the single-item option, for subjects readily eat the less preferred item (Kralik, Xu, Knight, Khan, & Levine, 2012); eating the less preferred item seems inconsistent with the negative value attributed to it. The effect also rules out the hypothesis that the less preferred item has no value, as Silberberg et al. (1998) suggested, because in this case the subject would be indifferent rather than prefer the single-item option. The current best hypothesis seems to be that both items have positive value, one greater than the other, and that the animals choose between the largest value (single-item option) and the average of the two values (mixture option). Because the average of two different numbers is always less than the larger of the two numbers, the animals prefer the single-item option (e.g., Chase & George, 2018; Kralik et al., 2012; Zentall, 2019). Zentall claims that this averaging rule or heuristic applies when animals choose between different quality foods. The hypothesis is ingenious, but it is challenged by a few facts. First, virtually identical experimental conditions have yielded two sets of results: preference for the single-item option and indifference between the two options; some studies have even produced both sets of results (e.g., Beran, Ratliff, & Evans, 2009; Sánchez-Amaro, Peretó, & Call, 2016; Silberberg et al., 1998, Experiment 4; Zentall, Laude, Case, & Daniels, 2014). We do not know what causes one or the other set. Second, not all subjects in the experiments that confirmed the less-is-better effect showed the effect (e.g., Beran, Ratliff, & Evans, 2009, Experiments 1 and 3; Chase & George, 2018, Experiment 1; Pattison & Zentall, 2014; Sánchez-Amaro et al., 2016). How then do we explain the opposite choice, or the source of the individual differences? Third, when the mixture option included two highly preferred foods—one slightly more preferred than the other—and the single-item option included one of these two, the animals preferred the mixture option, but the degree of preference varied with the content of the single-item option (Sánchez-Amaro et al., 2016, Experiment 2). These data suggest that if the mixture option included two qualitatively distinct but equally preferred items—for example, A and B, with Value(A) = Value(B)—and the single-item option included one of these items (e.g., B), then the animals would not be indifferent, as the averaging hypothesis predicts, but prefer the mixture. Zentall’s averaging hypothesis remains to be more stringently tested. Moreover, given a choice between a mixture option containing 20 g of the preferred food placed side by side with 5 g of the same preferred food, and a single-item option containing 20 g of the preferred food, chimpanzees were either indifferent or preferred the single, smaller option. But when the two items composing the mixture were presented one on top of the other, the chimpanzees preferred the larger option (Beran, Evans, & Ratliff, 2009, Experiment 2). Zentall mentions the first result, consistent with the averaging hypothesis, but not the second, inconsistent with it. Beran, Evans, and Ratliff (2009) suggested that ­fragmented food may be aversive, hence the preference for the single-item option over the larger, fragmented option. When the researchers placed one item atop the other, they may have disguised the fragmentation and thereby reinstated preference for the larger option. According to this hypothesis, then, avoidance of the mixture in the prototypical choice task stems from avoidance of an option that offers fragmented, nonuniform items. Although preferring the single-item option still incurs the cost of favoring the lesser amount of food, avoiding fragmented/nonuniform items might protect the animal from previously-interfered-with and discarded food. If this proves to be the case, the less-is-better effect, suboptimal as it may be from the point of view of caloric intake, may be optimal from the point of view of protecting the animal from dangerous food. This new, unanticipated function would remove the suboptimal tag from the effect. Future research needs to contrast these hypotheses as well as determine how quality and quantity combine to determine reinforcement value. Zentall’s hypothesis that deprivation level is important may help us understand the conditions in which the gastronomic value of food trumps its nutritional value. In one variation of the task, pigeons choose between two keys, red (R) and green (G). A peck at R yields a bit of food and ends the trial; a peck at G yields a bit of food but then, because R remains present, a peck at R yields another bit of food and ends the trial. Exclusive preference for G yields twice as many rewards as exclusive preference for R; surprisingly, the pigeons slightly prefer R.
Zentall advances the differential reinforcement hypothesis, although we prefer to phrase it in terms of associative strength: Whenever G is chosen, both G and R associate with the reward, G with the first reward and R with the second; when R is chosen, only R associates with the reward. As trial effects accumulate, R gains more associative strength than G, hence the preference for R.
But if some animals behave suboptimally and prefer R (e.g., pigeons, rats), others behave optimally and prefer G (e.g., cleaner fish and parrots). To explain the species differences, Zentall brings in the concept of impulsivity. The animals that prefer R act impulsively, and for that reason the second reward of option G is not associated with G. The animals that prefer G are less impulsive and for that reason associate G with both rewards. 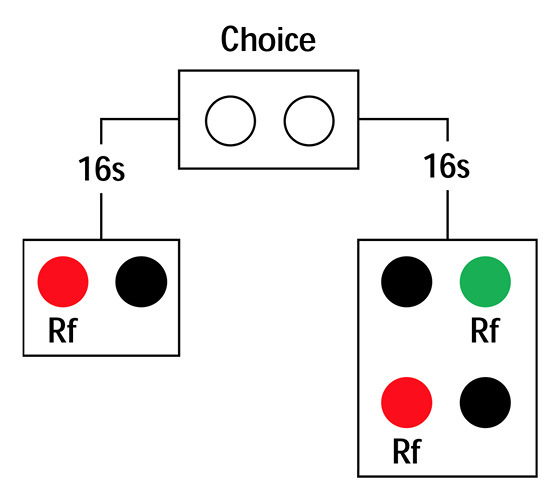 However, the impulsive animals can learn to choose optimally if we reduce their impulsivity by inserting a delay between choice and food (i.e., if R is chosen, food follows 20 s later and the trial ends; if G is chosen, food follows 20 s later, but because R remains present a single peck at it delivers food without delay). Zentall argues that inserting the delay may “encourage the pigeons to associate the second reinforcer with the initial choice of alternative B” (p. 9). The hypothesis is confusing, perhaps because it is insufficiently elaborated. First, it does not explain how impulsivity prevents associations when present (pigeons) and permits them when absent or reduced (cleaner fish). Whether in its colloquial sense of rapid, unplanned choices with little regard to long-term consequences or in its technical senses of preference for a smaller-sooner (SS) reward over a larger-later (LL) reward, or a steep delay-discounting gradient, in none of these senses is the relation between impulsivity and association clear. Second, all else equal, increasing the interval between two events makes their association harder to learn. Yet, without justification, the hypothesis assumes the opposite trend: that increasing the delay between choice of G and the second food facilitates their association. The concepts of impulsivity and association seem to be defined and coordinated in a rather Pickwickian way. The experimental test of the hypothesis showed that, with the delay inserted, pigeons and rats preferred G over R; their choices became optimal. Zentall argues that the delay reduced impulsivity in the same way it does in the commitment-response variation of the self-control procedure (see Figure 4 of the target article): Given a choice between an SS reward and an LL reward, pigeons prefer SS when consumption is imminent but seem to prefer LL when consumption is delayed (i.e., away from “temptation”). The evidence for the latter is that, well in advance of consumption, pigeons prefer an option that commits them to the LL reward to an option that preserves the choice between the SS and LL rewards. In Figure 4 of the target article, pigeons prefer the left key of the initial link. However, when the pigeons choose the right key, and 16 s later choose between the SS and LL rewards, they typically choose the SS reward. The SS reward is less valued than LL far from consumption but more valued than LL close to consumption. Hence, to extend the commitment response interpretation to the ephemeral reward task, one would need to show that option G is both (a) less valued than option R when consumption is imminent and (b) more valued than option R when consumption is delayed. To that end, the ephemeral reward task could be inserted in a response commitment procedure (see Figure 1).